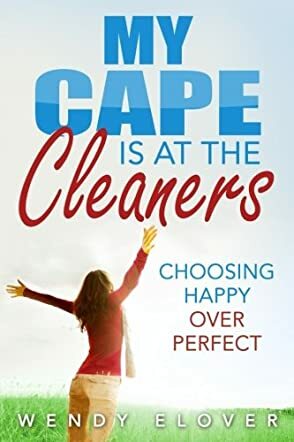 Wendy Elover’s My Cape Is at the Cleaners: Choosing Happy over Perfect is one woman’s perspective on the having-it-all-trying-to-be-perfect-superwoman lifestyle. Women especially seem to fall into the trap of wanting to be everything to everyone and yet along the way they lose themselves and their own dreams, often discovering that they have swapped those dreams for being able to check items off a to-do list and in becoming the ultimate people pleaser. Yet they are not getting personal satisfaction from it and instead are feeling aimless and as though they are just going through the same motions of keeping all the balls they’re juggling up in the air. Wendy had a serious ‘aha’ moment and from this she realized that she wasn’t really living her life ‘on purpose’ anymore. She was living the life that was filled with obligation, anxiety, and stress. It had been so long since she’d thought about her dreams for a big happy life that the dream itself was something she couldn’t remember anymore. So she set off on a personal journey to discover her whys and the things that really would make it a happy satisfying life. This is a quiet little book filled with little nuggets that can help you examine your choices and perhaps help you to find a new perspective on how you can choose happy over perfect. As Wendy did. Although there is no specific structure, or list of instructions on how to go about the changes, Wendy does offer her own personal map and the steps she took to change her own life. But more than anything, I think this book will really help anyone who feels stuck in a rut to shift their perspective. And the book may well be the shovel you need to dig yourself out of your rut and help you to discover those things that make you happy. Even if they aren’t perfect.